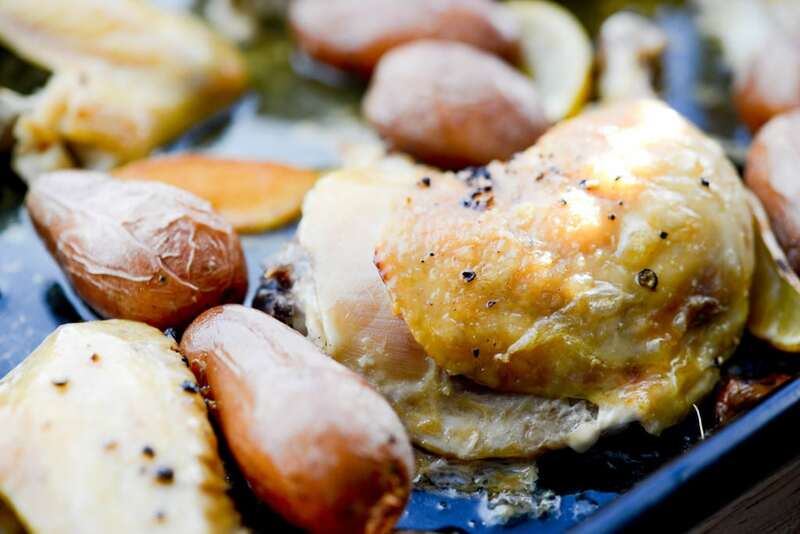 Are you looking for a low carb, easy to prepare weeknight meal? 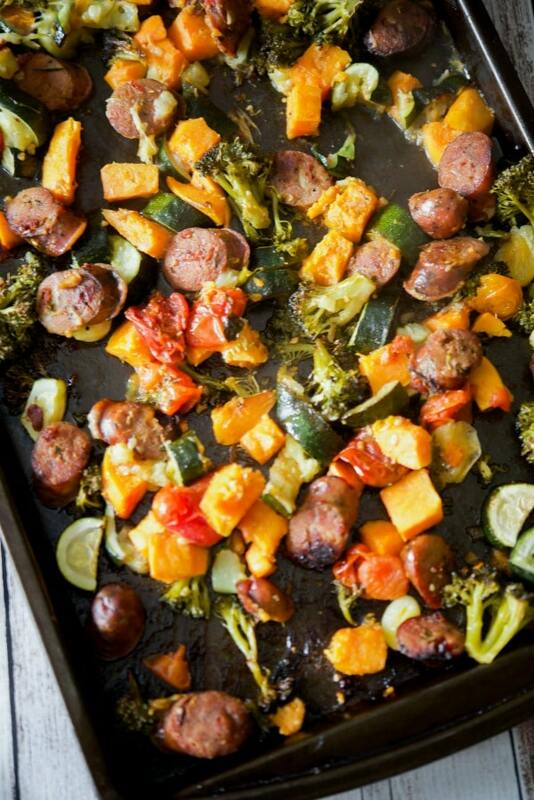 This Sheet Pan Italian Style Chicken Sausage & Vegetables made on one sheet pan is it! 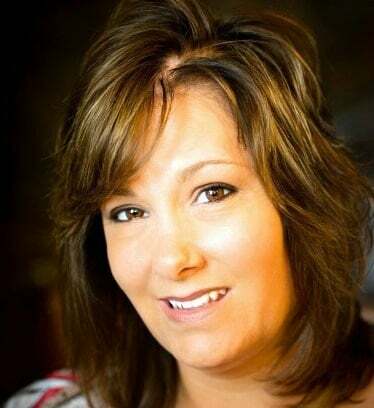 Recently, I attempted to try Whole30 and only stuck to the complete program consistently for about 1 week before altering it to suit our dietary needs. You see, eating coconut amongst other things, while it may be good for some, is not good for me since I have high cholesterol and ultimately caused my levels to elevate (and I gained even more weight on top of it instead of losing!). One of the meals I made to be compliant was this Sheet Pan Italian Style Chicken Sausage & Vegetables. Even though I ditched Whole30, the program did teach me that I do feel better physically without consuming dairy and wheat, so I’ve really been trying to cut those two out of my weekly diet. Surprisingly enough, it’s not as hard as I thought it would be. While I was food shopping at my local BJ’s Wholesale Club, I was looking for something new to make in the meat isle and came across Italian style chicken sausage. 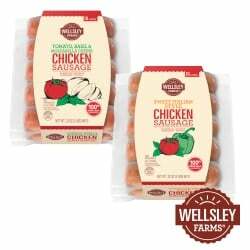 It’s made by Wellsley Farms and was gluten free, no artificial ingredients or MSG/Nitrites…even better! 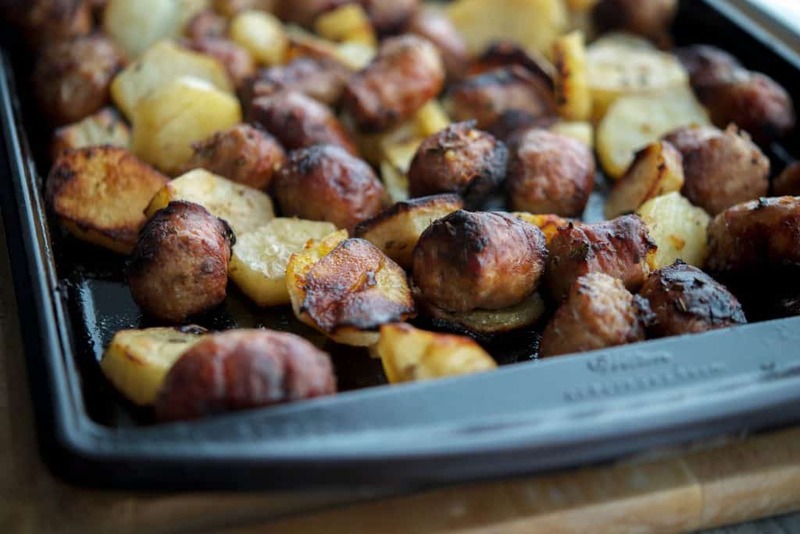 One of my favorite meals to make lately are on a sheet pan because you can just throw whatever you have on hand on them and cook all at once. Simple to make, delicious and little to clean up! 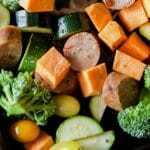 For this recipe I added fresh broccoli, zucchini, tomatoes, garlic and sweet potatoes. Then I drizzled some extra virgin olive oil on top, sprinkled with a little Kosher salt and fresh ground black pepper and dinner was ready in about 40 minutes. 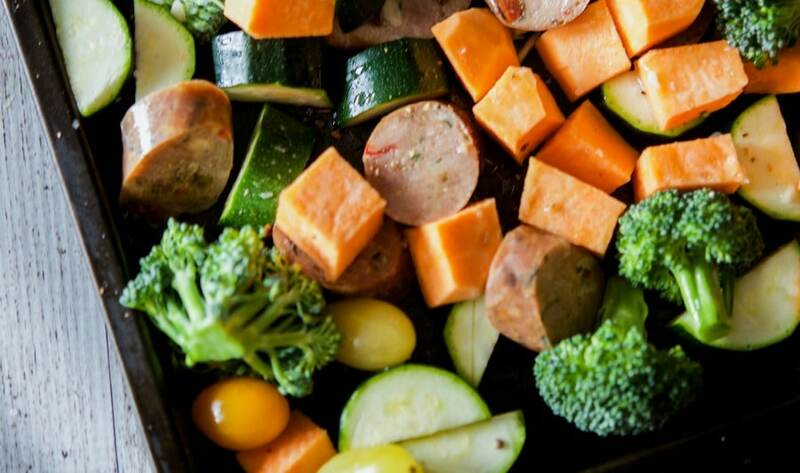 My family loved this Italian Style Chicken Sausage & Vegetables; even though our youngest daughter kept complaining that I wasn’t making her any “real” food any more. What I liked about this meal was that it was loaded with flavor. Add your own vegetables like mushrooms, onions, or peppers to make it how you like it. ~Enjoy! 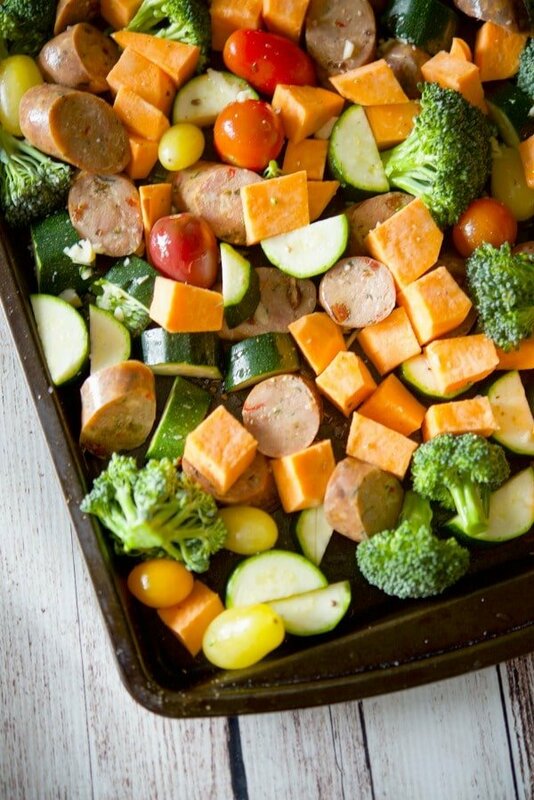 Add the sausage, broccoli, zucchini, garlic, potatoes and tomatoes to a baking sheet; then drizzle the oil on top and sprinkle with salt and pepper. 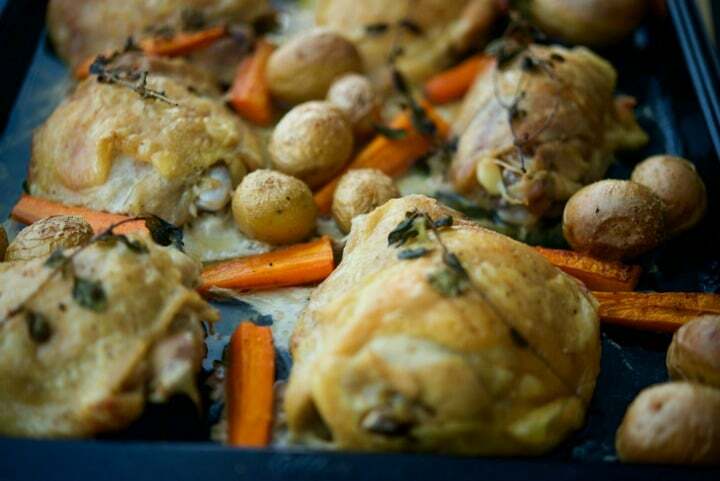 Place in the oven and cook for 30 minutes until the vegetables are tender and golden. Yummy dishes, thanks for sharing the recipe.